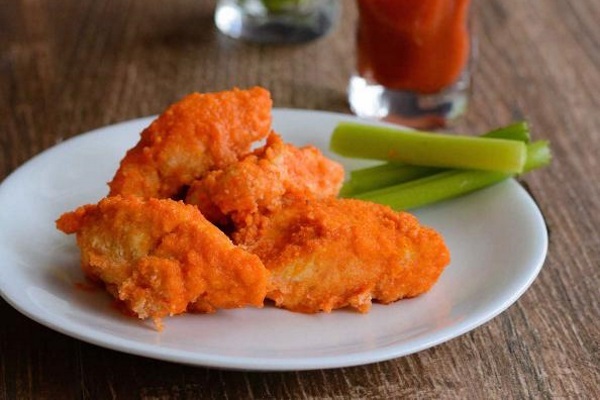 A typical chain restaurant serves wings at around 100 calories a pop. You can easily lighten things up by using flavorful spices in your breading and a touch of butter (yes, butter!) and hot sauce. And don’t forget about a healthier cooking method. Instead of frying, the trick to getting the nuggets crispy is baking and then quickly broiling. 1. Line a rimmed baking pan with foil, and grease with coconut oil. Set aside. 2. In a large plastic bag combine coconut flour, cayenne pepper, garlic powder, salt and shake to blend. Add chicken pieces to bag, close and shake to cover chicken. 3. In a small bowl add butter and hot sauce and stir to combine. 4. Dip chicken pieces into hot sauce mixture one at a time coating. 5. Place chicken pieces on baking sheet and bake in preheated oven for 20 minutes. Raise heat of oven to broil and cook an additional 2-3 more minutes. Remove and let sit for about 5 minutes before serving.